North side. You don't need a guide to go into this gentle forest, but you do need a car. There are many paved trails on the north side (along with buses of tourists). There are many dirt trails on the south side, the quiet side, of El Yunque. The paths down from Casa Flamboyant and Casa Cubuy take you into the heart of the forest to a series of waterfalls with great pools to swim in. Hiking on the south side of El Yunque. This tiny reserve is only open Wed through Sunday until sunset. Allhough practically unknown, there are some excellent paths, wooden bridges and lagoons where very large iguanas and water birds predominate. 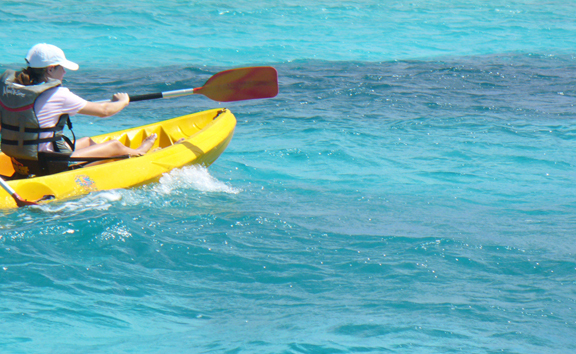 Kayaking tours are offered by a small company in the park. Park your car and walk the dirt roads to the lagoons and beaches. Once you reach the first beach ( no swimming, rip tides) continue to the second along the right fork. It is the prettier beach with a few seashells. If you move quietly you will be sure to see a heron or a migrating duck. The iguanas here are huge and dive into the water as soon as you approach them. Nice, easy, level trails. Barefoot Travelers Guesthouse is right next door, an easy walk. Your best beach option is Seven Seas Beach in Fajardo. Nice facilities, calm water and a restaurant. Several paths from the west end of the beach lead through the woods to the new 'North East Corridor Reserve'. Hours of walking and various places to swim and snorkel on your own. The public beach is guarded, the paths are in the woods • You should leave valuables at the hotel before going to any of the beaches in Puerto Rico, Culebra or Vieques. A little further west along the north coast is the town of Luquillo and its' varied beaches. Kiosks line the road and offer a variety of tasty local treats. The official Balneario de Luquillo is a long crescent beach with calm water and facilities. WATER TAXI FOR A DAY AT GORGEOUS ICACOS KEY. Follow the scenic superhighway south to the end (at Yabucoa) and then take a right and next left at the light, left again onto sea cliff road # 901 around to Maunabo. There's alot to see and several great places to eat. You can walk along the beach you see in this photo (too rough to swim) and the Maunabo beach. Punta Tuna can be visited during certain hours also ( closed Mondays and Tuesdays) . Operated by the municipality of Maunabo. More info on Panoramic Roads of Puerto Rico. . Follow the scenic superhighway to the end at Yabucoa and then take the sea cliff road # 901 around to Maunabo. There's alot to see and several great places to eat. You can walk along the beach you see in these photos (too rough to swim) and the Maunabo beach. Punta Tuna can be visited during certain hours also. Operated by the municipality of Maunabo. Panoramic Roads of Puerto Rico. For the beaches of NE Puerto Rico see the beaches page and for camping information, the CAMUY CAVE PARK. Fly or take the ferry to Vieques or Culebra from Ceiba and then the public bus publico or taxi for the day and come back on the plane or ferry. The most enjoyable way to do this is to fly over ( rougher passage on the ferry) and take the ferry back in the afternoon. DAYSAILING in the Cordillera Reserve with 'Ventajero' 52 foot yacht. 6 person max. Tel. 787-645-9129. Meet in Fajardo. Adventure trips into the rainforest with Aventuras Tierra Adentro, tel 787-766-0470, fax 787-754-7543. "Canyoning Adventure: From the base of El Yunque we will "rappel" along the waterfalls, descend on two exciting ziplines, leap from rocks into the river and much more. Here is a government website that offers a list ( and links) to all the historic sites in Puerto Rico. Historic Sites. Enjoy the horse races? El Comandante offers horse races and the clubhouse is a cool place to eat and to watch the races. Mondays, Wednesdays, Fridays and Saturdays 2:30 to 6 PM. Sundays to 6:30 PM. Free Admission. Just past the town of HUMACAO, on the south side, is the stables in Palmas del Mar. They offer several trail rides with guides. Excellent reviews Palmas has an equestrian center - Rancho Buena Vista, which offers trail rides through a tropical landscape and down to the beach. No experience needed, guided tours available or ride on your own! For more information and reservations call 787.479.7479. Old San Juan offers excellent walking around the old cobblestone streets and the massive forts of El Morro and San Cristobal. Debbie Molina, 'Legends of Puerto Rico' offers a guided tour, mornings at 10 AM and her unique 'Night Tales' and 'Night Tasting' tours in the evening. Gilligans Island in Guanica is a great little boat trip from the dock in Guanica and you can explore the scenic lighthouse area in nearby Cabo Rojo. Plus the mini Porta Coeli museum in San German. Coamo Hot Springs are on the way to Ponce.